Great tip. thankfully, mine are in good shape. While you will get a temporary effect from breaking down the rubber. It is something you will need to do over and over. Nothing will be better or last longer than a new set. I am offering a new set to keep in stock while they are still available and affordable. I tried the xylene and wintergreen oil trick the other day on my KZ550 boots (flipping the bike) and I am amazed. This trick worked very well. Since there was no way in hell I was getting the carbs and the airbox back on with stiff boots I figured spend the $15 on supplies for this. Going to put them back on the bike tomorrow after I figure out why the leaking carb. 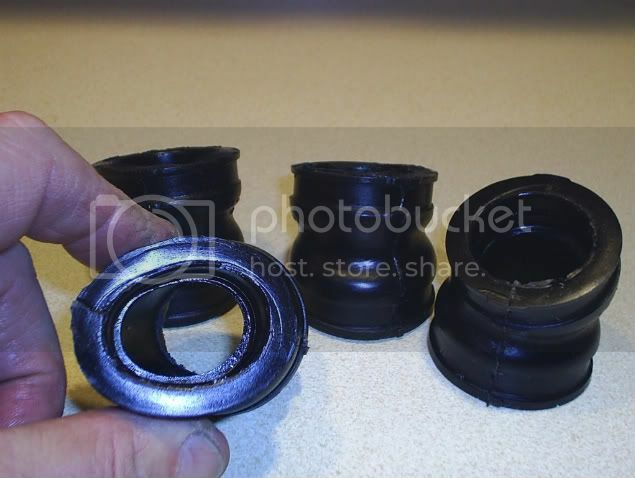 Diy-carb boots of silicone hose! That works too... Now clean them carbs up! Looks good, you run them yet? Not quite ideal as the stock boots are port matched (sorta) and using plain hose introduces steps in the intake tract leading to turbulence, at least in theory. Diy carb boots is working well on a CB750A Hondamatic. Almost impossible to find stock carb boots. Have been tested one summer, almost 5000 miles. Diy boots are better than cracked stock boots. Try Western Hills Honda, Seems like they have a lot of NOS parts. Call them and ask for the vintage parts dept. I think the guys name is Terry. There's also a place in California called All Gone Cycle 800.660.2453. Good luck! Just picked up 3 early to mid 70's 750's Hell Yeah! BELIEVE NONE OF WHAT YOU HEAR, AND ONLY HALF OF WHAT YOU SEE. I boil mine in tap water for 30 minutes of so, then with new stainless clamps (Mc-master Carr) at the ready; I slip everything on quickly, an cinch them up. Works exceptionally well, and has never leaked. Once they cool (You have about 45 sec-a minute) they are hard again, but the trick is to have a helper, and do it fast. Having a cordless drill, and long-reach nut driver helps get the clamps snugged faster, and lets you capitalize on the effects of the heat. Likewise, when I take them off, I always try to do it after the bike has been ridden, and all is warm. They come off with one hand then! yeah ive boiled them,its the only quick thing i could think of,as fabricator said youve gotta work fast,have everything ready and dont stop till its done,ive also used an impervious straight hose aswell,we have a hydrualic hose place directly over the street at work,they gave me a 2 foot offcut for free! !you just have to cut it square and even lengths,i can picture the step the fuel/air encounters,it may even create a "good"turbulence ,,im always optimistic though!!! I know that this an old thread, but if anyone needs carb boots for a 750A, I am making them. I looked for new boots for a long time, mine were cracked and no amount of softening was going to fix that, besides they were rock hard and impossible to get on. After looking for a viable source of some kind of replacements, I came up empty handed. I decided to make my own and have enough extras to sell a few sets. If you're interested, send me a pm and I'll send you some pictures and onfo. How are you making them? I'll try to post pictures and more information tonight (I'm at work). I made molds for each boot (4) and cast them using urethane. Here's a couple pictures of my reproduction boots. As I said, they are made of urethane, a very durable material that is resistant to gasoline, alcohol, brake fluid, and even Sea Foam. I soaked samples in all four of the fluids for over a month and found no change in the durability except the one submerged in gas showed a slight softening of the surface which disappeared once it was exposed to air. I have tried other materials and this seems to be the best option. The expected life of the material is estimated by the manufacturer to be 30 years, but I can't say that the boots will out last the originals. I'm planning on making the air cleaner to carb boots for the 550 next. You can see in the picture just how pliable they are. Sorry it took so long get back to you......work keeps getting in the way I'm selling the set of four boots for $30.00 plus shipping. If you're interested, send me an email with your zip and I'll let you know how much the shipping will be. As I said, I'm working on CB550 air box to carb boots right now, but I might do 750K boots next if there's enough interest. Nice work! I would post these in the parts for sale section. 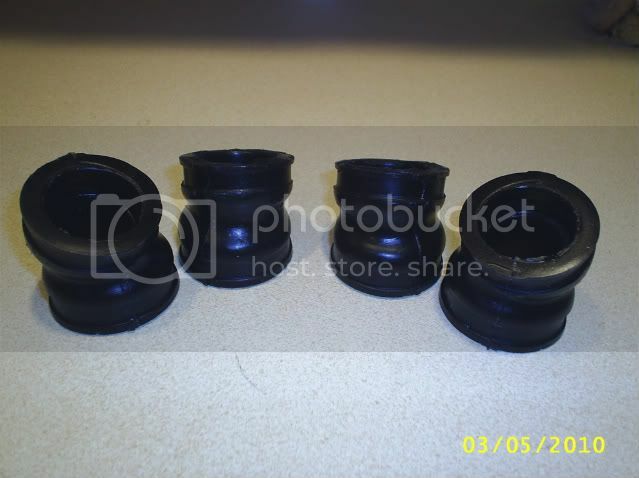 I have intake boots for 750A (all years) and 550F airbox boots ready to ship. I'll have 550K airbox boots and 750K intake boots in about a week. I should have 78 750F intake boots soon. A while back, someone posted about this using some home made concoction that included "mint oil" or something like that. I tried to search for it last night and came up empty. Who posted this? I saw that thread, and the results are terrific! I got 16 ounces of Wintergreen Oil from Amazon.com, mixed it 50/50 with a can of Xylol from Ace Hardware, soaked the first set for a night, and...nothing. Then I left on a business trip and forgot about them. Seven days later, they are brand new! So, I took out the second set I have. And the third. And the fourth (16 all together). They are all brand new, except the ones soaking tonite, which were like rocks. I even soaked the air horn (inlet side) velocity stack boots: they should not be soaked more than about 24 hours, max, or they get too big. They are polyethylene, and expand a bit. I may try baking them back down: I soaked them for a week, too. They also feel brand new, though! My next attempt will be to see if this can help the unobtanium versions, like the Kawi 650 inlet velocity stacks. They are as hard as plastic. I am completely convinced that this works so well that I am going to do it to every Four that shows up in my garage for a week or more, as part of the tuneup. And I'm going out to buy stock in some wintergreen oil company. "Moderation in all things - especially moderation. Too much moderation is excessive. The occasional excess is all part of living the moderate life." Sweet, bubbly, Buddha - Say it ain't so!!! Yep. And when they come out, the CB350 boots are going in next. so are the 750A boots the same as the 77-78 K boots? ?